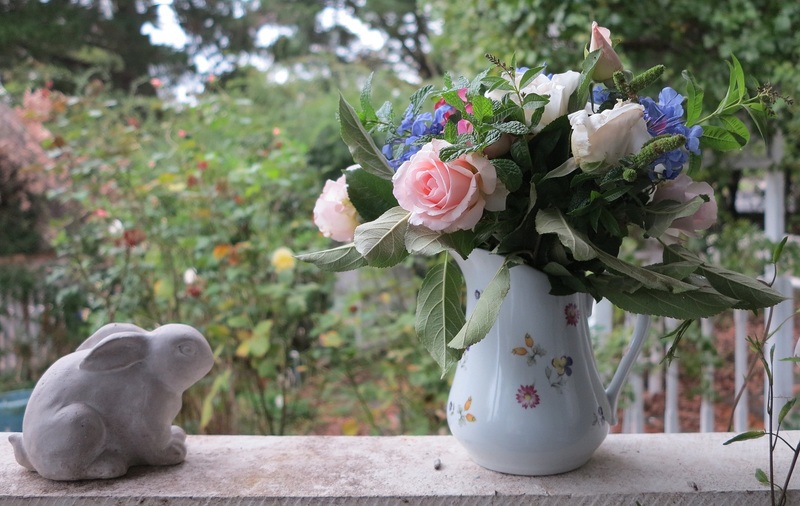 Dove Cottage Posy, all from my garden. 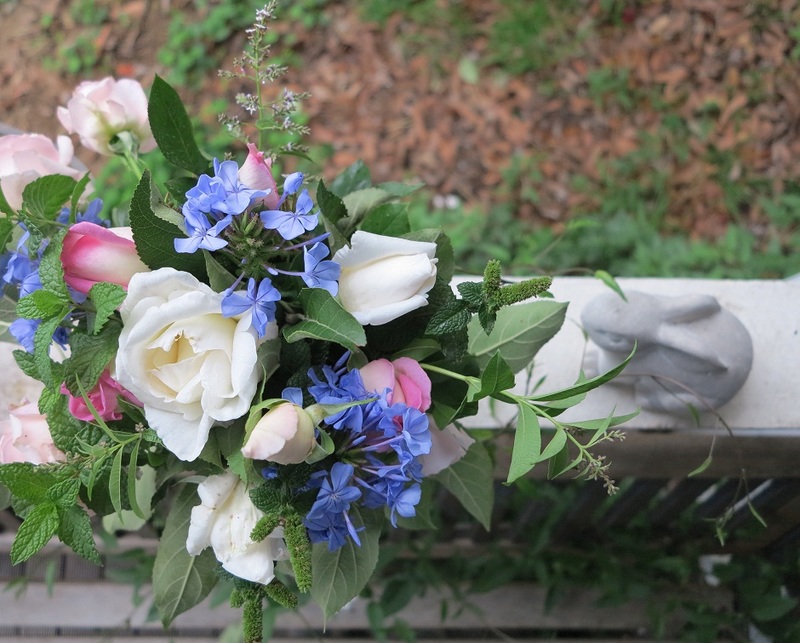 In the posy is Princess de Monaco Roses, Mt Shasta Roses, Mothers Love Roses, Plumbago, Lime Verbena, Granny Smith Apple Tree, and Mint. The mint in my garden is very special. Not only is it delicious and used often for Mojitos and Smoothies and Flower posies, but it came from a very special place. The original mint plant grew in my Nana’s garden. My Nana is my Mum’s Mum’s Mum. My Grandma gave me a cutting of the mint. My Grandma is my Mum’s Mum (Nana’s daughter – following?). Sadly both these amazing ladies have passed on. So this mint is not only a delight to enjoy but also a lovely connection to the great ladies in my family. And this posy of flowers is for my mum, hence the Mothers Love Rose inclusion too. Have you ever seen a more delicate shade of pink in a rose? It is sublime! 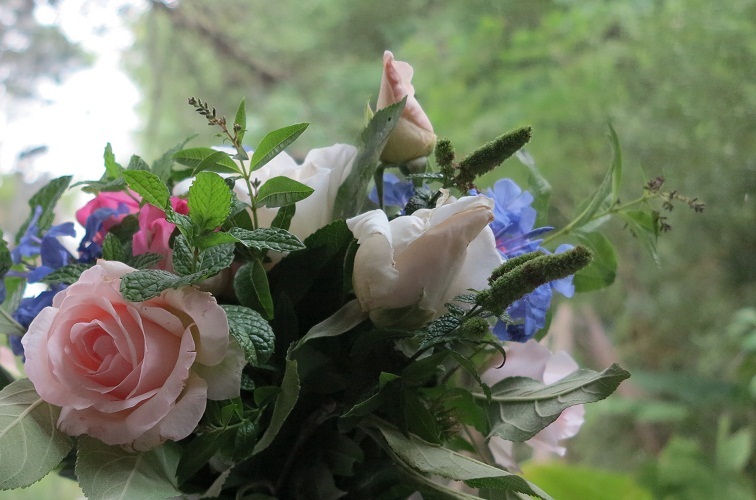 This posy had a scent to knock your socks off. 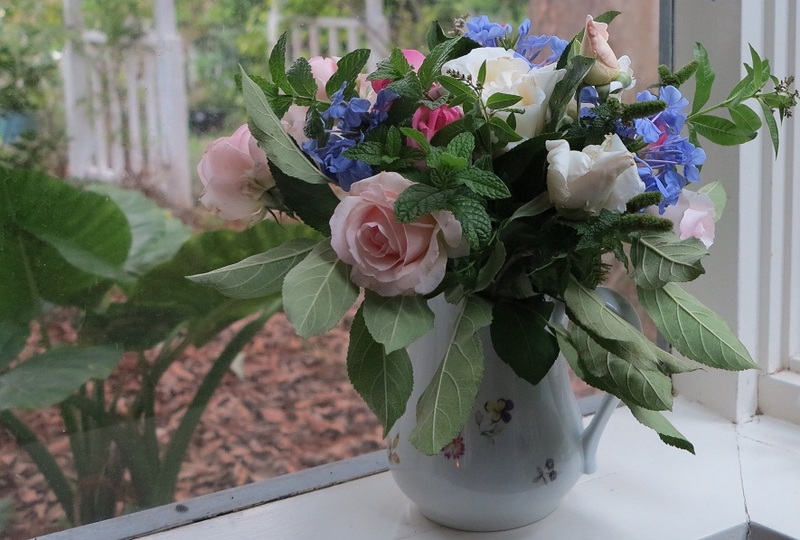 The mint, the lime verbena and the roses – sweet and fresh. I love the flowering tips of the mint and verbena too – especially the fluffy mint ones, they are quite unusual I think. I must admit, the posy was put together in about 5 minutes flat, sorry mum! Just one of those snap decisions as I saw the roses in the morning and knew the rain of the day would ruin them by the time I got home from work. I also new that one of my favourite blogs Floret, is doing a project called The Seasonal Bouquet Project. This is where the lovely Erin (from Floret) and Jennie (from Love ‘n Fresh, another sweet flower blog) are posting pictures of AMAZING bouquets each week. You can add you own bouquet of flowers to a link and join along, but all the ingredients from your bouquet must be sourced within 25 miles from your home. Well I think all mine were within 25 steps from my front door so I decided to join in. And remember these hearts from my last post? Well they were part of a special little order I’ve sent off to a sweetly named shop called ‘Mint Willow Studio‘. I’m super excited about this new part of the adventure for ‘bear loves dove’ and can’t wait to see where it leads me. I only wish I didn’t live so far away from the shop so I could go visit it for real! In the meantime a virtual visit will have to do. Hope you find some minty fresh goodness and pretty floral beauty in your day today! 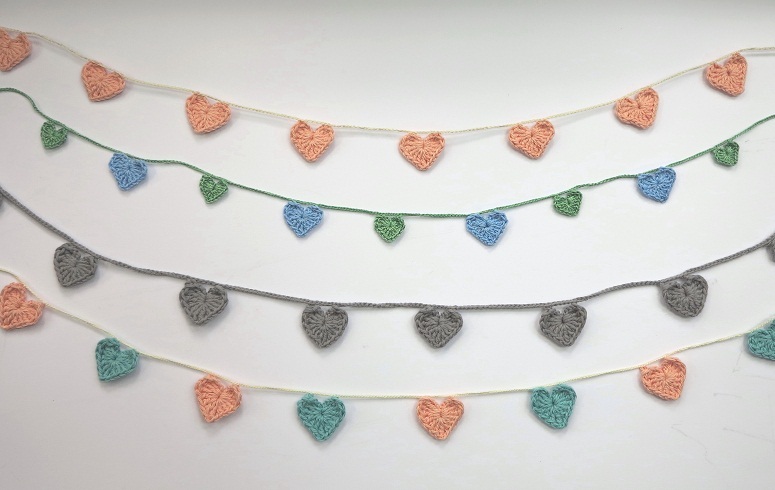 This entry was posted in craft, crochet, garden, Photography, Uncategorized and tagged 100% cotton, cotton, crochet, flower, flowers, garland, granny stitch, heart garland, mint, organic cotton, posy, roses. Bookmark the permalink.